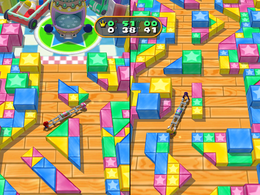 Battery Ram is a 2-vs-2 minigame in Mario Party 7. Its name is a pun on "battering ram". The teams carry their battery to the starting line. The aim of this minigame is to be the first team to reach the end of the obstacle course. Each player holds on to one end of the battery and both players must cooperatively move around to get the long object through tight corners. Whichever team gets to the end of the maze first wins. Rules – "Help your partner carry the battery through the blocks. This one takes patience!" Advice – "If you get stuck, you may need to back up and try a different path." The minigame highly resembles Kuru Kuru Kururin. This page was last edited on September 3, 2018, at 11:11.